Here are the next 10 quilts - these are technically "June's quilts". I had big goals on taking pictures of 20 quilts today but the weather is both windy and biting cold, so I managed to only get these 10. Our winter decided to actually come and visit us late in February this year! It was amazing - over Christmas and most of January, we barely had freezing weather. Now we've got in the 'teens (F) and it's staying below freezing all day. Here are many similar to what you've seen before. I'm especially thankful to the ladies who sent me the really special ones - the one that is brown with tan sashing - blocks on point - a very elegant quilt and the stars one! You sent them to my sis in Florida and we got them here in Poland. The Around the World Top centers were made by friend in AZ and I added borders. My sis and I added borders to the other panels. The larger one (number 9) was also made by my friend in AZ. 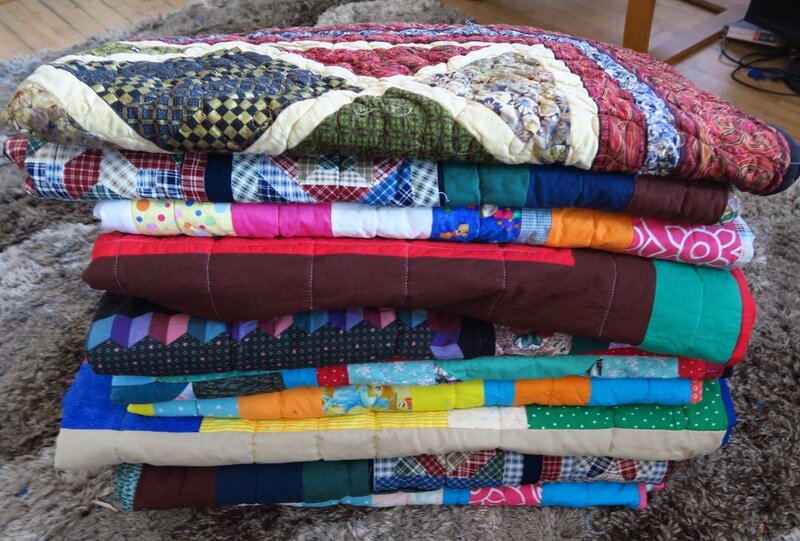 Note: If you happen to just love making tops (but don't like to actually quilt them - or have the cash to have them quilted), have time and energy and want to contribute tops, I'll take them. Seriously. I'll finish them and we can give them away here in Poland. My criteria is pretty loose - just a top that is well made. I have no other requirements as to size or fabrics used. I can use whatever you send. I've finished up everything from double knit tops (very heavy - will last forever) to some very well made by my definition but not so pretty (ok-- ugly) crazy blocks tops. All are taken. There is no accounting for taste and we all different. What I dislike, others like and vice versa. What I think will go first, often doesn't. Here's something I wrote up for people who might be interested. My charity quilts ABC. One thing about it - the people here aren't very picky when it comes to quilts. It is cold here in Poland and they need the warmth. For that I am grateful! 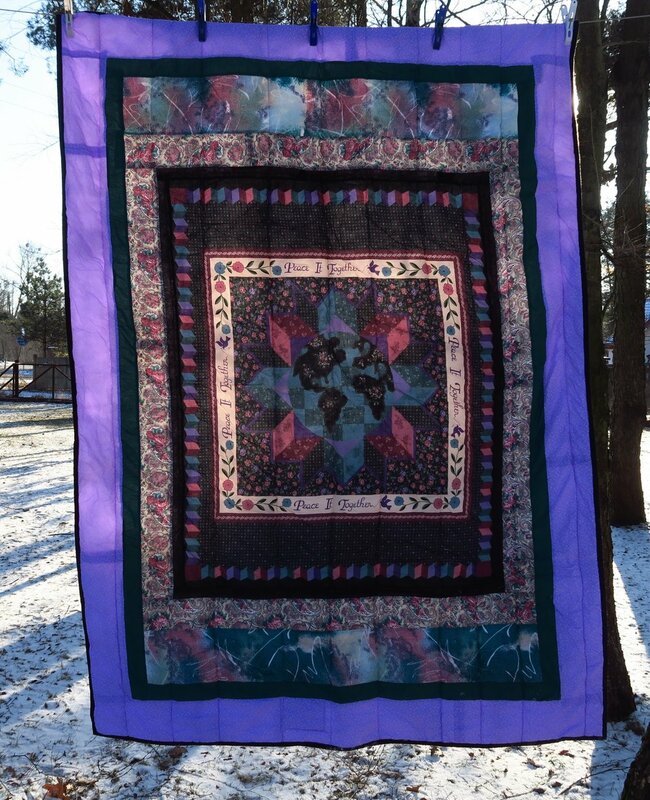 One thing I was reminded of - I won't take these pictures with the sun coming in right behind the quilts again - it is too hard to get a good picture. I could have turned them around on the line so that the sun was coming in behind me. It's just that we've had so little sun since November - I thought I'd try it. We got about a half inch of snow last night so there is some fresh on the ground. Plus, I was fighting with the wind. Just so you can see the windy conditions I was trying to deal with, check out this quick video. And once again - here they are loaded in the back of the van, ready to head to church on Sunday (I took these pictures on Saturday afternoon). My stacks at the church are getting ever higher. I only have 60 more to add now - at least for the time being. I added a fourth pile. Soon I will sort them by more or less guy/ladies and children's piles just to help myself see what I've got. And don't forget - if you have any fabric needs - be sure to check out what my sis has in the store for you!